Welcome The Biennale web-portal ! The Biennale Internationale Design Saint-Étienne 2017 will present a state of the art and a great experiment, a giant laboratory, entitled Working Promesse focused on the shifting work paradigms. Work is one of the major preoccupations of our society. For us all, work provides both income and status, it promises emancipation and a future. At the heart of political and economic concerns, offshoot of the dream of a generalized full-employment, at the beginning of this 21st century work, it undergoing an entire transformation. From digital labor to the sharing economy, the world of work is being reconfigured; it is inventing new organisations, new services but also new throes and new hopes. Designers, companies and the entire Saint-Etienne territory will gather in 2017 around this topic in order to confront different perspectives, ideologies, innovations and desires. And it is with the participation of the public that we will work towards this promise..
- Share utopie ? Work is an exceptional space for technical and organisational inventions that exploits an entire part of humanity, leading to suffering as well as hope. However, it also reveals nonstandard productive capacities that fascinate, deviate and absorb our imaginations. From the design of an interface meant for the management of a shared service to the active participation in citizen groups, designers take up ideological perspectives that are going to sustainably contribute to the elaboration of our environment. - Future existences. The questions that are going to stir up the Biennale Internationale Design Saint-Etienne 2017 will provide an opportunity to explore the experimental forms of work through its tools of production but also its fictional and futurist dimensions: will we still need to work? At what rhythms? Alone or collectively, in networks or in atomized ways? Will we be under surveillance? What value will we have? Will there be gender, race or aptitude segregations? What issues will technology resolve? Who will be in charge of it? What will we gain from it? How will we experience it? Design is also in a period of transition: from object to service, from urban dimension to social dimension, the scales on which design has a role to play are being multiplied. Working Promesse, shifting work paradigms will be an opportunity to use design to interrogate our future lifestyles. Follow us and become a fan of the facebook page ! The Saint-Etienne International Design Biennial 2017 will be celebrating its 10th edition from 9 March to 9 April 2017. The scientific management of the event has been entrusted to the research department of the Cité du Design led by Olivier Peyricot. The 10th Saint-Étienne International Design Biennial will examine the ways in which the world of work is changing. Work is one of the major preoccupations of our society and until now it provided people with an income and status. The traditional salaried forms of work seem to have evolved to the point of partially disappearing or being radically transformed with the advent of a total focus on the digital. Work culture is infused in all the strata of our society, influencing the organisation of living spaces and social relations. These changes are taking place at a time when the economic, social and environmental crises are calling into question many aspects of the way we live and our organisations. The analysis of work is a terrain that lends itself to an obligatory re-examination of man's relationship with nature, and the production of objects - tools, devices - whose design is seized upon with a great deal of inventiveness at the same time as they are being redefined. The appearance of new economic models, connected to major innovations in communication technologies in particular, raises issues for the conventional company relating to its very form: what will the enterprise of the future look like? What will the jobs and skills of tomorrow be? What new forms of collaboration will develop between employees and employers? What will they offer the individual in terms of his or her own existence? Are other forms of organisation possible: co-working, job-sharing, group working, project-based working, self-employment? What will the economic impacts of the digital and collaborative revolutions be, with free access, open source, communities, etc.? What objects will accompany these changes in jobs and skills? How will this new relationship with work challenge design in its production of forms, spaces or services? What are the alternatives and proposals offered by design in the post-industrial society? 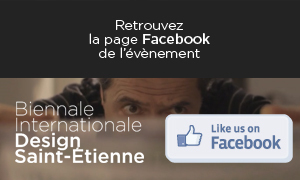 Suivez nous et devenez Fan de la page facebook de l'évènement ! The Biennial 2017 is positioning itself at the heart of these changes. It will be an opportunity to make an in-depth assessment, to open up alternative, speculative and creative perspectives through the singular view that design takes of these changes in society. It will constitute a vast field of experimentation across the Saint-Étienne district, where the imprint left by industry is still a vivid presence: how can such an area enter into synergies with these new forms of activity and even create, in a sustainable way, infrastructures capable of accommodating these developments?